Has anyone measured the induction port timing with a degree wheel for a 150 or know what it is, i.e, opens at (x) BTDC and closes at (y) whatever? I've looked in the forums and on the net and can't find it. I've measured mine which has been slightly modified by an unknown amount and it opens at 117deg BTDC and closes at 46 ATDC. I was wondering how close to stock that still is. Excuse me for butting in to your thread Jim! Bluecati, did you try the 3 different slides? Was there much noticeable difference between them? I have a few stoxk written down at home i think. Although i have to ask- do you have a copyh of the norrie4 ker manual? If you want to play with inlet timings it's worth reading. I'm sorry, it probably would've helped if I'd said why I was asking in the first place. I do have that manual for my own education and have looked through it, though I'm not interested in tuning. What I was hoping to determine was whether my slightly mod'd inlet port is compatible with a stock top-end or would there be problems? I can't tell from the Kerr book or not. I'm thinking maybe not, but only someone experienced with tuning would know. Put up a pic and we can compare it. Well that's another question. If you are at 163 ish degrees open, that's very conservative, and virtually stock. Road tunes on stock top ends call for around 170-185 degfrees. Kits can go as high as 220-230, alt6hough more is not necissarily better. According to the book, it appears I'd have to do my own port-mapping and inlet timings to determine it for sure and I don't even have the stock top yet. Sigh, I was hoping that someone had the quick answer. I agree it's not much off and is probably fine. I gave you the quick answer. Another scoot with the same top end,pipe ,carb and jets but with a NORMAL slide was seizing every hour or so. seems they got around emission laws by leaning the midrange via cutaways in the slide. If you put up a picture then we can compare it. If it's not noticeably different from a stock pad, then it's not going to make a real difference. Come on Jim, I know you have it pieces! 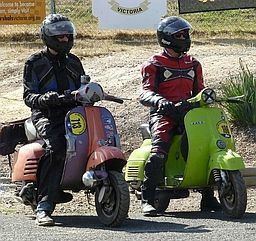 I ride a tuned Vespa. Of course I've seized lately! Sounds like a plan, I'll put it on my list. Cheers.